The Garden of Live Flowers: June: Where are the flowers?? Not much to report this month. The seeds I direct-sowed last month did not germinate. The wintersown plants scattered around the gardens vary in robustness, with the nicest one growing in full sun and heavy clay soil next to the vegetable garden. Still nary a flower in sight. The anticipation is killing me! We're blooming on the damp north side! Must be the lake breeze! Where have all the flowers gone, long time passing... Anticipation, is making me wait. (Sorry, went really retro on you there.) Well, your foliage looks a lot foliager than mine, and I just have the one bloom. Am really glad I got its photo yesterday before a huge thunderstorm moved through--looking very bedraggled today. From what I've seen so far, you might win the prize for Big Nasty. That's one healthy, happy-looking nasty. Hopefully it will pop soon. Mine aren't blooming yet either. It might take them a while, considering their shaky start. That's really disappointing. I've had trouble with poppies not germinating this year. I can't figure out if it's too hot, too cold, or too wet. 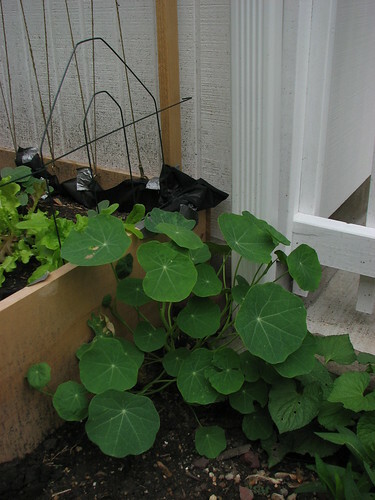 I've struggled with getting nasturtiums to flower when growing them from seed...hopefully you'll get some blooms soon if the sun finally comes back! Your seedlings are pretty lush, if you want more flowers than leaves don't fertilize them too much because they grow foliage instead of blooms when they get a lot of fertilizer. I love nasturtiums, but I've never had much luck with getting them to bloom. I found a flower bud this morning. Very exciting!! MBT, I never fertilize outdoor plants. It's making those abundant leaves all on its own. Your's is one of the healthiest specimens I've seen so far! Are you letting it trail out and roam around on its own or will you help it climb? Mine is in a pot on a pedestal in with a black-eyed Susan vine, I'm letting them flow out of that and downward. I'm not too pleased with 'Spitfire's' growth habit up to this point. I'm hoping it'll take off soon!